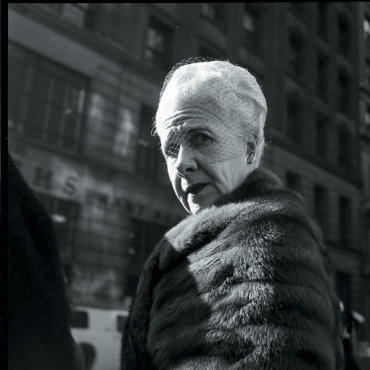 "Finding Vivian Maier: Chicago Street Photographer" at the Chicago Cultural Center. We wish Maier had lived to see this excellent overview of her recently discovered work. Vivian Maier, Untitled (detail), no date. "Heidi Norton: Not To See the Sun" at ebersmoore. Norton exhibited her photographs alongside glass and wax sculptures containing plants in this show exploring perception and decay. "Mark Bradford" at the Museum of Contemporary Art. Bradford's mixed-media works are haunting documents of South Central Los Angeles as well as black history. "The World As Text" at the Center for Book and Paper Arts. A reading room built by John Preus and Columbia College students was the perfect backdrop for this roundup of zines and other independent art publications. Temporary Services, Personal Plastic: Self-Reliance Library Banners, 2010. "Social Mobility: Collaborative Projects with Temporary Services at the Mary & Leigh Block Museum." Temporary Services' retrospective highlighted their still-radical approach to art. �Dianna Frid: Evidence of the Material World� at devening projects and editions. UIC prof Frid's new sculptures, mixed-media works and artist�s books riff on snippets of language from sources such as dictionaries, obituaries and The Odyssey. "Belligerent Encounters: Graphic Chronicles of War and Revolution, 1500-1945" at the Art Institute of Chicago. Drawn from the Art Institute's permanent collection, this show�s 160 prints, posters and other works on paper provided valuable historical context for the museum's Soviet World War II poster exhibition "Windows on the War." "Excavating History Collective: Body of Work" at the International Museum of Surgical Science. Led by Rebecca Keller, the Excavating History Collective infiltrated the entire IMSS�even the bathrooms�for this site-specific exhibition. "Luminous Ground" at the Illinois State Museum Chicago Gallery. Works by Ellen Lanyon, Ralph Arnold and nine other Chicago artists whose careers span at least 50 years reminded viewers that our obsession with youth is misguided. "Bertrand Goldberg: Reflections" at the Arts Club of Chicago. This fascinating survey of the Marina City architect's art collection and one-off designs remains open through Feb 8. We found this year's best shows at small galleries such as ebersmoore and devening projects + editions as well as heavyweights like the Art Institute of Chicago. Click on the image to read the review.